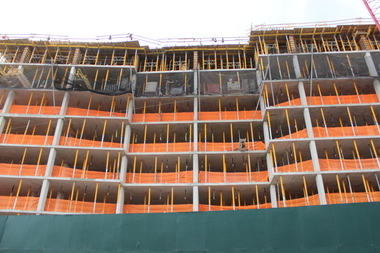 Construction is underway at 550 Vanderbilt Ave., one of several towers being built as part of the Atlantic Yards/Pacific Park complex in Prospect Heights, which received 421-a tax breaks. MANHATTAN — The cost to execute Mayor Bill de Blasio's plan to create 80,000 new units of affordable housing could balloon by $2.8 billion if developers are required to pay a prevailing wage to construction workers, the nonpartisan Independent Budget Office said Monday. Real estate developers and construction labor unions have until Friday to reach an agreement over wages for workers building new developments under the state's 421-a tax break program. Gov. Andrew Cuomo has said a deal to renew the abatement — first implemented in the 1970s to spur housing development during a fiscal crisis — must include some form of a prevailing wage requirement for construction workers for buildings with 15 or more units. "Prevailing wages" refers not just to pay, but also requirements regarding health insurance premiums, retirement contributions, life insurance and paid leave. They differ according to professional specialty and are generally substantially higher than median wages industry-wide, the IBO report said. The IBO analyzed the 57 new construction projects in the city that were subject to federal prevailing wage requirements and found, on average, an estimated 13 percent increase in total construction costs. The requirement translated roughly in an increase per unit of $45,000. The report fed the concerns of the Real Estate Board of New York, which is negotiating with the construction unions. NYU’s Furman Center for Real Estate and Urban Policy also found that if construction costs increase, the development of rental housing could become more expensive and that the government would have to increase subsidies to cover costs. That, in turn, would limit the type and amount of affordable housing that gets built, according to a November report. But the nonpartisan Fiscal Policy Institute called the IBO’s analysis “flawed” and “should not be used to inform public policy decisions.” The IBO report, for instance, looks at budgeted rather than actual construction costs, the Fiscal Policy Institute said. This argument bolstered the Building and Construction Trades Council, which is also a party to the negotiations. The council believes prevailing wages are a matter of fair pay and better work. “The report does not even factor into consideration the massive tax breaks developers receive under the 421-a program, which would reduce any construction cost differential considerably,” Council President Gary LaBarbera said in a statement. “We firmly believe that since developers are receiving public funds, they have a responsibility to pay good wages with benefits and ensure safe worksites, unlike what the majority of affordable housing contractors do today,” he added. Albany extended the city's current 421-a regulations in June, giving the unions and developers seven months to agree on a new deal. That deal would remain in place through June 15, 2019. Besides rentals, the program also would apply to developers building condos in the outer boroughs with no more than 35 units, with average sales prices roughly about $700,000 and a requirement that new residents remain in their units for at least five years. Though de Blasio had called for different changes to be made to the program, he said Monday, at an unrelated press conference, “I would say to all those doing negotiations, they should pay very close attention to the fact that so many people in this city want to see this succeed so we can get on with the work of creating affordable housing." If the two sides can’t hash out an agreement and the 421-a program were to end, the loss of the exemption might result in lower land prices, according to the Furman Center. “The loss of the 421-a exemption would reduce the amount that residential developers would be willing to pay for the land and so land prices may fall unless developers of commercial offices or other allowable uses are willing to pay the original prices,” the report stated.